A natural shampoo bar, ideal for dry hair. This shampoo bar is made with coconut and vanilla and is 100% free from sulphates. This shampoo bar is so easy to use – just lather up in your hands or directly onto your hair, and rinse like liquid shampoo. 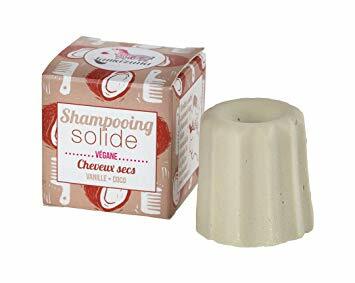 This 5* shampoo bar, ideal for dry hair. This shampoo bar is made with coconut and vanilla and is 100% free from sulphates. This shampoo bar is so easy to use – just lather up in your hands or directly onto your hair, and rinse like liquid shampoo. It is suitable for dry hair. This natural shampoo bar will last twice as long as your liquid shampoo, and the natural ingredients will ensure your hair is moisturised, shiny and soft. This is perfect for travelling with as it is easy to pack because of how small and long lasting it is – the best thing is that it also won’t be included in your liquids allowance when flying!